One morning in January 1979, a woman named Mrs. O’C. woke up to the sound of loud music. She assumed she was dreaming—the music was the same music that she’d heard in her dream that night. Yet she continued hearing the music as the day went on. Frightened for her sanity, she visited her doctor, who referred her to Oliver Sacks. Sacks found that Mrs. O’C. was in good health, suggesting that the source of the music wasn’t a stroke. He performed EEG tests on her, and found that whenever O’C. heard the music in her head, her temporal lobes experienced seizures. By mid-April, the songs had faded from Mrs. O’C.’s mind—she even told Sachs that she missed them. In the first section of the chapter Sacks clarifies what, in the narrowest sense, is the “problem” with Mrs. O’C. : she’s experiencing seizures in her temporal lobes. However, this explanation cannot do justice to the music Mrs. O’C. hears in her head—her personal associations with the music, the nostalgic emotions it arouses in her, and other important factors in understanding Mrs. O’C.’s condition holistically. Oliver Sacks came upon a similar case, in which a woman named Mrs. O’M. reported hearing the song “Glory, Glory, Hallelujah” again and again for years. Mrs. O’M. seemed to be in perfect health, except that she’d had recent bouts of deafness. EEG tests revealed that Mrs. O’M.’s temporal lobes had an unusual amount of activity, comparable with the amount one would expect during an epileptic fit. Mrs. O’M.’s condition is, at least on paper, similar to that of Mrs. O’C. ; however, as Sacks shows, it’s important to understand the more intimate, personal differences between the two patients, rather than simply interpreting their disorder as a seizure of the temporal lobes. What was the cause of Mrs. O’M. and Mrs. O’C.’s “musical epilepsy?” To understand the answer, Sacks says, we’ll need to look to the findings of the doctor Wilder Penfield, who located the area of the brain associated with seizures—the temporal lobes. Penfield learned that by electrically stimulating the area, he could give his subjects vivid hallucinations of sound. Penfield’s key insight was that his subjects’ hallucinations weren’t just hallucinations—they were also accompanied by a strong, euphoric feeling, often nostalgia. Mrs. O’C. and Mrs. O’M. reported feeling like “little girls again” when they heard music in their heads. Penfield’s findings emphasize not only the new sensations triggered by the stimulation of the temporal lobes, but also the new perceptions and emotional overtones brought about by a seizure. This might suggest that in order to understand Mrs. O’C. and Mrs. O’M. fully, neurologists would need to understand their emotional character and understand whether they have some special predisposal to feel nostalgia. Why would the brain hallucinate certain songs, such as “Glory, Glory, Hallelujah?” Penfield argued that there was no real significance to the music—any song that the subject remembers fairly well could resurface when electricity was applied to the temporal lobes. Sacks questions Penfield’s conclusions, though—perhaps there’s some special significance to the songs. Sacks ran further tests on Mrs. O’M. to see if he could find any personal significance in the songs she heard. During his tests, Sacks learned that she was already apt to hum the songs before she hallucinated them. Even though Penfield’s findings emphasize the importance of nostalgia and emotional reaction to seizure, he believed that there was no rhyme or reason to which songs his patients hallucinated. Sacks is more inclined to believe that seizure hallucinations reflect personal associations, and found that Mrs. O’M. did, indeed, have some special association with the music before she began hallucinating it. A recent article posited that the secret of the great composer Dmitry Shostakovich’s success was that he had a metal splinter, a fragment of a bombshell, in the temporal horn of the brain’s left ventricle. Shostakovich claimed that he could hear music in his head by tilting his head to one side. Thus it’s possible that he was able to control hallucinations of music, which he experienced due to brain damage. Shostakovich is often regarded as one of the key composers of the twentieth century; therefore, his strange condition emphasizes the role of neurological abnormality in creativity. Where Sacks’s predecessors speculate that musical hallucinations stem primarily from physiological causes, Sacks emphasizes both physiological and more personal stimuli; for example, it seems not to be a coincidence that Mrs. O’C. was an unusually nostalgic person, since her parents died when she was still young (Sacks doesn’t unpack this theory, but his point seems to be that a person whose parents died when they were young would be more likely to be nostalgic for the period before the parents’ deaths). One reason why the study of musical hallucinations is so new is that it’s very difficult for neurologists to study the inner workings of memory—perhaps because memory can’t easily be reduced to a mechanical, left-brained model (as Sacks argued in Part One). In order to better understand memory, Sacks suggests, neurologists need to make more of an effort to understand their patients’ perceptions, rather than simply identifying the physiological parts of the brain in which memory could be said to occur. Sacks raises a hypothetical: Mrs. O’C. and Mrs. O’M. could hear a piece of music in vivid detail because of the stimulation occurring in specific parts of their brains. Thus, it’s not inconceivable that, in the future, scientists will develop ways to perform “psycho-surgeries” that can remove specific memories. However, Sacks also notes that, in the future, neurologists might try to help people who suffer from amnesia reconstruct their memories. Neurologists would do well, Sacks argues, to use a holistic form of therapy that addresses the complex network of subjects’ experiences, rather than simply trying to recapture specific memories. Sacks concludes that such projects are still a long way off, since as of now, neurologists don’t really understand the origins of musical hallucinations. Again Sacks distinguishes between two ways of describing the mind: first, as a series of discrete parts, each of which governs different mental functions (and, by the same logic, different memories); second, as an interconnected whole, such that any specific memory is linked to other memories and mental processes. Sacks clearly favors the second approach, and encourages his peers in the neurological community to learn about memory by studying their patients holistically and getting a sense for their personalities and backgrounds. Arn, Jackson. 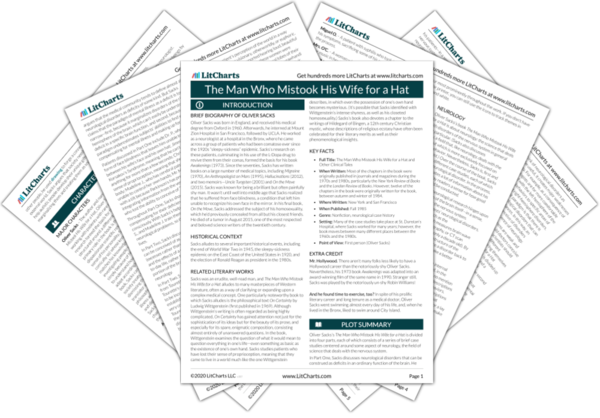 "The Man Who Mistook his Wife for a Hat Part 3, Chapter 15: Reminiscence." LitCharts. LitCharts LLC, 17 Apr 2017. Web. 22 Apr 2019. Arn, Jackson. 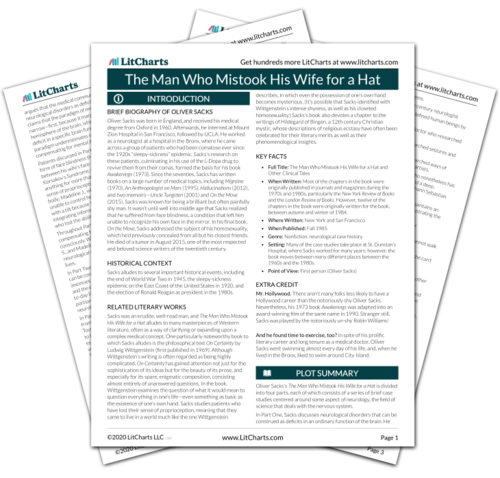 "The Man Who Mistook his Wife for a Hat Part 3, Chapter 15: Reminiscence." LitCharts LLC, April 17, 2017. Retrieved April 22, 2019. https://www.litcharts.com/lit/the-man-who-mistook-his-wife-for-a-hat/part-3-chapter-15-reminiscence.